DUNGEON DEFENDERS TOURNAMENT FORMAT- A format of Crystal of Power Destroying fun with a Destructible Object Crystal card. Heroscape skirmish assault- An added rule set with a downloadable PDF rulebook for an alternate play style that includes all your figures in your army each round. Some mechanics borrowed from Imperial Assault Skirmish. GIANT HEROSCAPE DICE-Made to go with my Big Utgar dice Roller. Quasatch Hero-Custom sculpted giant squatch hero using Torquelnas body as a skeleton. Kratos-A figure that is made of cloned parts and custom sculpting to be used with HOF's God of war Kratos card. GIANT PURPLE WORM- Inspired by Youtuber DM Scotty, converted and made for Heroscape. Marro Hivelord- Green stuff sculpt from all my bits and pieces of leftover greenstuff compiled into a figure and painted up. 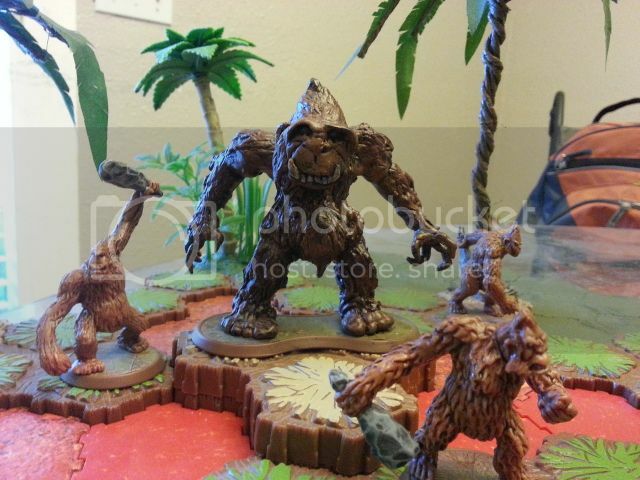 Quasatch Sage, Ezio Auditore, Katniss Everdeen -Green stuff sculpts and mods.Can't get enough of the squatch. Ezio and Katniss Figures to go with Heroes of Fiction cards. Dzu Te Hero-Dzu Te hero made from greenstuff. Yoda- Didn't want to pay five bucks or more for yoda, so I cloned a Jawa I had, hacked him up and modded on some greenstuff. HOF's Dexter Morgan and Harry Potter- Simple figure paint jobs with greenstuff weapons. Laglor-Custom cloned and painted vydar flag bearer. WO-SA-GA- Clone for a tournament Prize. Armoc Viper Clones, Ewok Clones, and Shades of Bleakewoode Clones. -Finished pictures with some work in progress shots as well. Bespin Luke Skywalker, Yoda, Armoc Viper Clones, and Ewoks Finished.- Custom mod Luke skywalker Yoda, Finished armoc clones and Ewok clones. Dzu Te Champion i sculpted out of green stuff. I used floral foam and sticks held together with hot glue as the skeleton. Primadon champions- The one on the left is a king kong figure that was modded with some deathwalker 9000 guns and greenstuff. The one on the right is a Paintjob of a Reaper mini Ape-X figure. custom tagawa archers for proxies since I had only 1 squad of them and they never got any love. I made them from extra izumis and greenstuff with a paintjob. custom warlords Achilles and maximus. Maximus The one above is actually a hulk figure, repainted and modded with greenstuff for the armor and shield, sword is from some elf wow figure. Achilles is a modded crixus figure with part of a raelyn spear and greenstuff for the armor and additional gear. Last edited by TREX; February 25th, 2018 at 04:58 PM. Custom Grok warlord using bits of Torquelna's rider, a spear from Grimnak, and a starwars boma figure i repainted all held together with greenstuff and super glue. Custom mimring sculpt, im gonna call him frostbite. No greenstuff on this guy, just paintjob and well cut incisions for putting him in a different pose. Especially digging the Grok Warlord. This is my Custom Quasatch Behemoth Warrior I made out of a Torquelna as a skeleton. It is made out of greenstuff. This is my first figure mod that started it all. Thanks hs2010 I only posted a fraction of my work. It will take a while to get it all on here. Ive been creeping around this site a long time and have a ton of stuff ive made. Im going to post a ton of my custom cards soon. most have been sufficiently test played and tweaked by my scape group. including cards for these guys. Last edited by TREX; February 25th, 2018 at 04:59 PM. No Greenstuff on Frostbite, he was actually before I used Greenstuff, he has just been tactfully chopped and repositioned with an exacto knife and super glue. Thanks for looking Orgsbane. I will eventually post many more, I just work too much and don't have tons of time for all this stuff I love to do. I am a big fan of the Hoss customs produced on this site, I do not however like to spend massive amounts of money on small pieces of plastic. Here is a Greenstuff mod I did for my Boba Fett to play HOSS with. Wow, you have some serious skills with greenstuff. Those are sweet custom minis!